…. because we are members (parts) of His body. For this reason, a man shall leave his father and his mother and shall be joined [and be faithfully devoted] to his wife, and the two shall become one flesh. This mystery [of two becoming one] is great; but I am speaking with reference to [the relationship of] Christ and the church. Perhaps this is one of the hardest things to do in marriage. I wonder why God had to insist on the man to leave and cleave to his wife. From my own observation, it’s a daunting task for a man to shift his loyalty from his parents to his wife, but it can be done anyway. This does not necessarily exclude the wife – since some are still controlled and manipulated by their parents – but it explicitly mentions the husband. The man. What is leaving and cleaving? I know you have come across men who have been married for some time but unable to “cleave” to their wives. Reason being, they haven’t left home yet. What is leaving and cleaving and why does God insist on it so much? God knew that leaving is hard but cleaving is harder. Imagine being joined to one person who is so different from you, with different backgrounds and different idiosyncrasies, yet, you are to be “glued” together to weather the tides of life and the turbulence that hits marriage. Just like the Church and Christ – the oneness that he wants us to experience by being “renewed in him”, God, wants us to have the same oneness in marriage. Our marriages should model his relationship with the church. The ultimate personification of the gospel. Leaving and cleaving did not begin in the new testament. God designed marriage, gave away the first bride, Eve to Adam, and told them to “go, multiply and subdue the earth.” He wanted them to experience the joy that come with being one. Although Satan perverted and corrupted God’s plan then, he still redeemed us back to him with the blood of Jesus Christ. When a man has taken a new wife, he shall not go out to war. Neither shall he be charged with any business. But he shall be free at home one year, and shall cheer up his wife, which he has taken. God knew that cleaving is not easy and hence insisted that all newlyweds should not do anything else save for rejoicing over each other. In that one year, a lot would have happened. 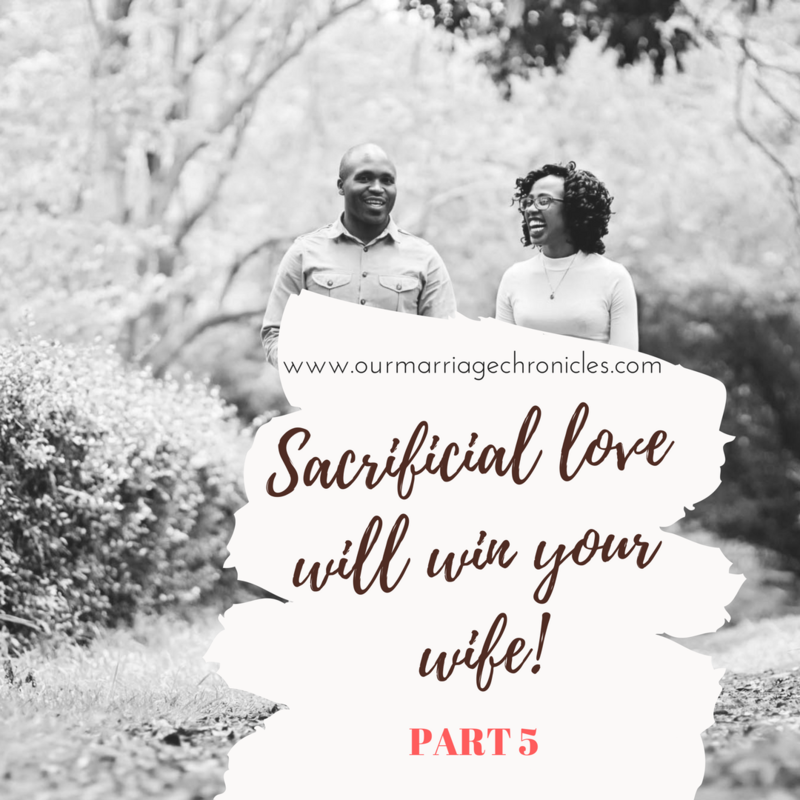 He specifically did that because he knows that a husband and a wife have got to learn and lean on each other through the various seasons of life. For God to bless Abraham, he was commanded to leave his kindred and go the land God directed him to. He had to leave. There could be childlessness in one season and loss of a job in the next. Through all those seasons, God taught and still teaches a wife and a husband to cleave to each other. Leaving and cleaving means that you do not depend on our parents, relatives, brothers or sisters, but on each other. It means your wife takes the dominant place in your life and so does your husband. It means listening to her, preferring her ideas over everyone else, more so in public. It means not stripping your wife’s shortcomings to everyone, but covering her in love and in deed. It means putting her in the picture every time, everywhere. I love how my husband puts me in the picture. At no given point does he make me feel small nor does he run off with ideas suggested to him without them passing through me. We deliberately make our parents and sibling know that if my spouse isn’t comfortable with it, we will not go through with it, but instead, offer other ways or ides that we have both agreed on. Did it come naturally? No we learnt. This is my story. We wanted to buy a fridge for our house when we got married, and by then, my dad had some very good suggestions for me. I love my dad. He was the one who molded us. He was our best friend too so i took everything he said with a lot of weight. I was always like “dad,dad,dad” and never did he feel preferred. There was the clash of wills! I nagged and he did not even flinch! At the end of the day, we clashed, we hurt each other with our words, we fought so hard. Do not make my mistake dear wife. Do not make the mistake dear husband. Let me give you some practical way. Suppose your mother, asks you for some money to help her sort out some issues in the house. It’s very natural for all of us to help our parents. In fact, we cannot ignore them, otherwise we will be ripping curses. But suppose your wife was to attend a baking class that she wanted to for a long time and she too wants to go. Who will take the priority? So instead of dismissing your wife so fast, why don’t you sit down with her first and explain what has happened. Ask her respectfully, if she would be willing to set aside the project for this urgent need. Do not dictate it to her that she must help. Do not make helping your parents arbitrary because the truth is they aren’t. Your wife has parents to and if she has to pull the same card, then your marriage is at a risk of running into a mud-hole. She too had an urgent need. Probably her baking class was top of her priorities, so be very sensitive to her needs too. Then the second part comes, where you have to put your wife “in the picture” especially to your parents. We learnt to “put each other in the picture.” Actually to make each other central! You are not being disrespectful, no, but wisdom calls for careful consideration to show them exactly where your loyalty is. Your parents cannot hate you for that, but it will definitely bring your wife into the picture – modeling how exactly a marriage should be. They will know that you make decisions together and in turn, respect her too. Leaving and cleaving does not mean that you disregard your parents, but they shouldn’t dominate your lives. You show them respect by listening to their ideas or suggestions, but finally, you make our own decisions, you and your wife. Your parents, siblings and everyone else should know that you speak in unison. Your differences should be sorted when you are just the two of you. Leaving and cleaving does not necessarily mean staying miles away from them. But we always encourage newlyweds to move away from their parents since for some, the challenge of “leaving and cleaving” can be real especially with parents around. Unfortunately, it’s also possible to live continents apart but still make your wife feel secondary to others of which that was never the Lord’s design for marriage. He designed for man and woman to cleave to each other, supporting each other, the goal being at the finishing line not alone, but together. Your marriage matters to GOD dear husband. He doesn’t expect you girt your teeth together, clench your fists and say “I will conquer.” Even the best of marriages do not depend on their own resolve. It’s not possible to be a man without Christ. The two cannot be separated together. Accept the challenge Mr. You cannot love others at the expense of your marriage or your relationship with your wife. All other relationships are secondary. I don’t mean that they are not important, but your relationship with your wife comes after your relationship with Christ. Trust me when you cleave to your wife, you won’t need to keep reminding her about your mother needing shopping, a new dress, some money for upkeep. She will automatically respond your Christlike-ness. Do not be apathetic to your marriage. Marriage is full of competing priorities and only God can help you pull through. When you understand that you have the power to draw your family and more so your wife to Christ, then everything else changes since the RESPONSIBILITY of leadership squarely lies on you. Your wife is a sacred tool that the Lord uses to show you how far you are in your walk of faith. If you want to know how well you are doing at being effective, look at your wife. You will know. You are not a “boss” to your wife. You are a leader and leaders lead by modelling an example FIT to be followed. If this series has helped you, then it’s time to go back to your wife, confess your sins to each other that you may be healed. (James 5:16). If you don’t repent to each other, then you miss the restorative power of the cross. Begin again for it’s never too late to model a Christ-like marriage. That doesn’t mean that it will be devoid of sorrow. Our walk of faith both has times of rejoicing and times of sorrow, both of which are borne willingly. Marriage is not all about happiness but sanctification. Marriage is a gift. This is the gift – LESS OF US AND MORE OF GOD. Previous PostMONDAY TIDBIT - The focal point of relationships - Christ.